Hold the SHIFT button while you select the objects that are to be removed from the selection set. 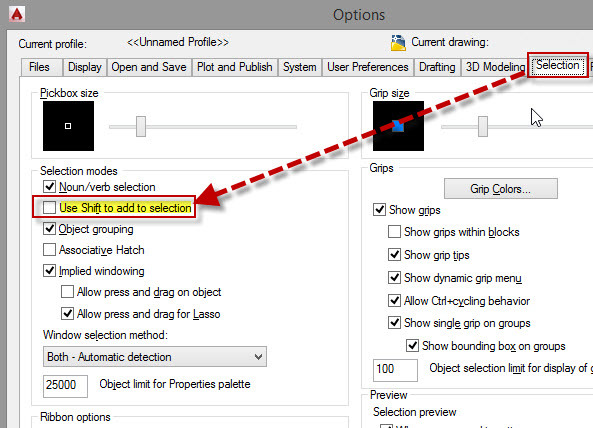 If this isn’t working for you, check the OPTIONS dialog box > Selection tab > and in the “Selection modes” area, make sure that the “Use Shift to add to selection” is unchecked (shown below). Why does this not work in 2013? I works for me with 2013. I wonder if you have a setting that’s been changed and that is what’s causing this to not work for you. This doesn’t work in 2015! What’s the work around to make it happen? It does for me and the entire class I am teaching this semester. Check the variable in the above comment. What should Pickadd and Pickfirst be set on if I cannot deselect elements during a stretch command? I have tried shift to deselect and it is not working, I have tried “options” then “selection” and the box shown “use Shift to add to selection” iff unticked. I have tried ticking this box too, and nothing is working. I always used to use the cross selection (across many objects) and used to deselect those that I did not want to select by Holding down the Shift key and deselecting. HELP PLEASE … some setting has turned on or off without my knowledge, I think??? it didn’t work on auto CAD 2010, why? I added a picture of the OPTIONS dialog box in the post. Check to see if the option shown is unchecked.